Can a scanner be future-proof? The Datalogic Gryphon GBT4400 shows that even with all of today’s advancements in the barcode scanning arena, a carefully engineered scanner can stand the test of time. In addition to its advanced reading technology, the Datalogic Gryphon GBT4400 can detect the natural actions of the user. For a limited time, the Datalogic Gryphon GBT4400 can be purchased at a heavy discount. Typically, the unit retails for $912 and includes a scanner, stand, cable, and power supply. Right now, System ID is offering open box units for just $365. The Datalogic Gryphon GBT4400 offers Bluetooth connectivity, allowing the reader to transmit data through its base station or a Bluetooth device. In addition, the scanner features Datalogic’s Motionix motion-sensing technology. This automatically switches the scanner into handheld mode when it is picked up, and returns it to stand mode when it is placed back on the stand. Users no longer must scan a code or flip a switch to change from one mode to the other. This saves time and effort, speeding along the scanning process and enabling retailers to serve more customers faster. Motionix and other advanced features help the Datalogic Gryphon GBT4400 compare favorably with other 2D scanners. For example, the Gryphon can scan while charging, unlike similar units such as the Honeywell Xenon 1902 and the Motorola DS6878. The Gryphon also provides more scans per fully charged batter and a higher IP rating for particulate and water sealing. 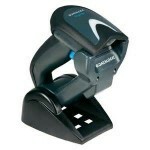 For more product comparisons, see a detailed data sheet listing the features of each of these scanners.